Selling Newmarket Hydro would Improve Service, Reduce Bills and make Newmarket a Debt Free Community! Newmarket-Tay Power Distribution is electricity distribution company. It is licensed by the Ontario Energy Board who also approves any rate increases. The shareholders are the Town of Newmarket and Township of Tay. It is governed by a Board of Directors (http://www.nmhydro.on.ca/aboutus.asp) and the head office is located on Stevens Court in Newmarket. In 2004, Newmarket Hydro and Tay Hydro merged. In 2005, Newmarket Hydro was under the impression it had a deal to purchase Aurora Hydro. At the last minute, Powerstream made an offer and Aurora Council decided to sell their utility to Powerstream for $34.5M (http://blog.powerstream.ca/2005/03/aurora-agrees-to-sell-hydro-utility-to-powerstream). Currently Powerstream serves Barrie, Collingwood, Aurora, Bradford, Richmond Hill, Markham, Vaughan and surrounding areas. Newmarket-Tay Power Districution Ltd serves Newmarket consumers. Skyrocketing hydro rates has had a negative impact on jobs in Ontario. Over 300,000 manufacturing jobs have been lost since 2003 in the province. We have seen this first hand in Newmarket. 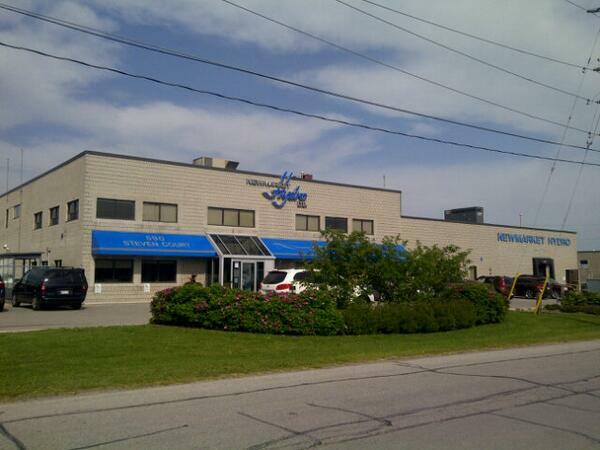 At the time of the merger Newmarket Hydro had 44 full time employees. The province is asking the provinces 80 distribution utilities to voluntarily merge (http://toronto.ctvnews.ca/panel-wants-ontario-electricity-distribution-companies-to-voluntarily-merge-1.1078151) with an eventual target of 8-12 total to save the system $1.8B in costs over 10 years. Every $100,000,000 in savings translates into $7 in annual savings for consumers on an average hydro bill (http://globalnews.ca/news/411020/ontario-government-wont-force-local-electricity-distribution-companies-to-merge/). The province will not force mergers for now, but that could change. Our leverage selling Newmarket Hydro at a fair price decreases in the event of forced mergers. For this reason the timing of a potential sale is optimal now. Many Newmarket residents I have talked to complain about the service with Newmarket Hydro. In 2010, there was controversy in the major newspapers after Newmarket-Tay Hydro donated $2350 to the Ontario Liberals (http://www.theglobeandmail.com/news/national/public-utilities-should-not-be-donating-to-ontario-liberal-party-ndp-says/article1215927/). Newmarket Hydro was overbilling us and is now paying us back at $1 per month over the next two years (http://www.yorkregion.com/news-story/1935192-newmarket-hydro-bills-reduced-1/). Compared to Powerstream's support of community events within their territory, it is rare seeing Newmarket-Hydro supporting community events in Newmarket. Powerstream also does a great job communicating with consumers via a hotline, website, blogs and social media. By comparison the communication from Newmarket-Tay Hydro is very weak. I believe we can achieve lower bills, better service and more community support by merging with or selling to Powerstream. Powerstream serves 365,000 customers. It is jointly owned by Barrie, Markham and Vaughan. Powerstream is "committed to providing its customers with safe, reliable and efficient service. We achieve this goal by focusing on operational efficiencies and procedures in order to minimize overhead costs and maximize the use of company assets. In other words, if you are one of our customers, PowerStream strives to be efficient and provide you with optimum service, safely and reliably". Powerstream is a leader in providing accessible service to its customers. They take pride in supporting the communities that they serve. They are an environmental leader supporting solar technology, carpool initiatives and electric cars. They support innovation and have invested in customer friendly technology including the smart grid. I have had an opportunity to tour Powerstream and meet with key executives including the CEO. I was very impressed and consider Powerstream to be a first class company providing outstanding service within their territory. I strongly believe Newmarket would be better served under Powerstream. A potential sale of Newmarket Hydro to Powerstream would have many benefits for Newmarket residents. Broadband infrastructure could potentially be negotiated into the sale utilizing hydro poles. Newmarket is currently over $50M in debt. Selling Newmarket Hydro would set us on the path to becoming a debt free municipality as is currently the case in Brampton. Debt comes within interest charges and a sale of Newmarket Hydro would eliminate these interest payments neutralizing any lost revenue from dividends currently paid to the Town of Newmarket from Newmarket-Tay Hydro. Newmarket consumers would receive be better served by Powerstream's communication efforts, community support and smart grid technologies. There would be few job losses as most Newmarket Hydro workers would be hired by Powerstream to serve the new territory. Economies of scale would reduce Newmarket hydro bills. Clearly it does not make sense to operate as a small island surrounded by Powerstream territories. I have intentionally not mentioned the sale price that Newmarket Hydro would generate. I do not want to prejudge the outcome as this would have to be negotiated. A merger is also possible, but would not result in Newmarket becoming a debt free community. My preference would be selling to Powerstream, but the process should be open to all bidders who might be interested. I have been asked by Newmarket residents how I will pay for my platform. The sale of Newmarket Hydro would make us a debt free community and would leave additional funds to pay for some of the initiatives I have discussed in my platform. If elected in October, I will direct staff to research options, provide information and begin the process of selling Newmarket Hydro early in the next Council term. As always I am looking for feedback on this issue. Please contact me at 905.716.9655, darrylwolk@Hotmail.com or on social media.